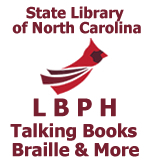 This entry was posted in Adaptive Technology, BARD, braille, collection, Digital Magazines, events, large print, resources, talking books and tagged Governor Roy Cooper, libraries, Library of Congress, National Library Service, NCLBPH Day, North Carolina, North Carolina history, north carolina libraries, North Carolina Library for the Blind and Physically Handicapped, North Carolina Library for the Blind and Physically Handicapped Day, North Carolina State Library, Proclamation, State Library of North Carolina. Bookmark the permalink. Enter your email address to receive notifications of new Digital Magazines added to NOBLE by email.